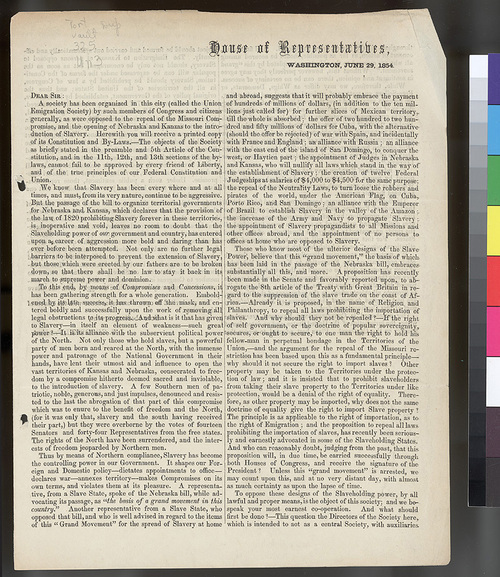 This printed letter from the House of Representatives in Washington, D. C., was written by John Zacheus Goodrich, a representative from Massachusetts. He informs the reader that members of Congress and regular citizens of the city had formed the Union Emigration Society. The founders oppose both the repeal of the Missouri Compromise and the opening of the territories to slavery. It includes details about the Missouri Compromise, the assumed designs of Slave Power, and states that "our watchword is Constitutional Freedom everywhere within the jurisdiction of the United States."